Captain Beefheart (Don Van Vliet), “Coeur De Boeuf, Sur Le Sable”, before Rome festival in 1968 (*video listed as 27/1/1968, festival around 5/6/68). 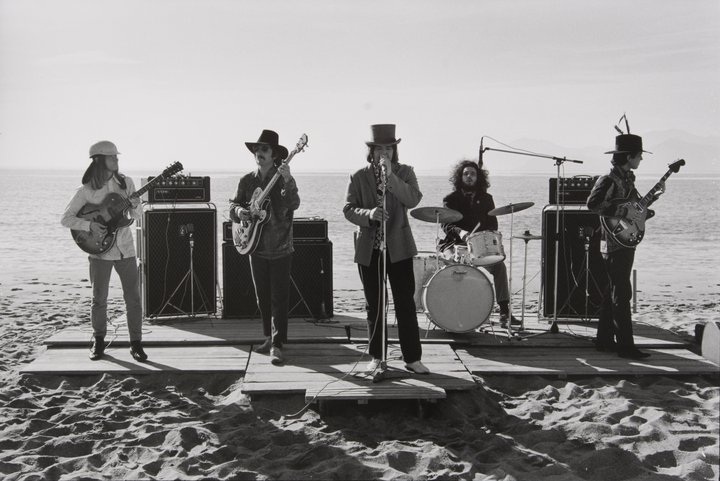 Captain Beefheart and the Magic Band filmed this video on the beach at Cannes. The big central speaker cabinet is one of the original bigger 7/4series prototype cabs, with a closed back. Two AC100s sit on top of it, along with what looks like a couple of Supremes on the sides, and a pa cab. They would go on to play the Rome festival, with an entire back line of 4/7series with assorted cabinets (more on post here). lists Beefheart’s comings and goings around Europe, back to the States, and back to Europe again in 68. Apparently there are bootlegs of the Cannes gig out there.